It’s been nearly two years since Erik Rintamaki of Michigan’s Upper Peninsula spotted something unfamiliar and utterly intriguing along the shores of Lake Superior under the setting sun and evening sky. The discovery of fluorescent sodalite, which Erik named “Yooperlites,” caught the attention of geologists, mineralogists, rockhounds, educators, and just about anyone who had lived in or visited the Upper Peninsula at one time or another. The origin of the name “Yooperlites” is the abated abbreviation of “U.P.” for Michigan’s Upper Peninsula. “Yoopers” are the area’s colloquial citizenry. “Lite” refers to the rock’s fluorescent properties from sodalite. Since making the discovery, Erik has spent quite a bit of time talking about Yooperlites and leading rockhounding tours. Of course, as a dedicated rockhound whose hobby is also his business (www.yooperlites.com), a good day rockhounding is a good day all around. My wife, Brenda, and I had the good fortune of hearing Erik speak about his discovery and spending time with him in September of 2018. Early in our autumn travels, we went to the Upper Peninsula of Michigan, one of our favorite rockhounding areas. 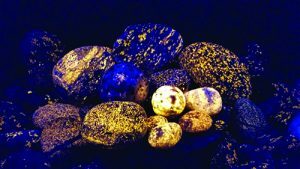 A few years earlier, we successfully explored the western region of the U.P., so this time around we mapped out the eastern region to explore with hopes of finding prized Lake Superior agates. The region is rich in mineral heritage and was the United States’ major supplier of copper for more than a century. From the mid-1840s to 1968, the Keweenaw Peninsula mines produced an estimated 10.5 billion pounds of copper. Our second day into the trip, we stayed at Muskallonge Lake State Park, located on the U.P.’s northeast shores near Newberry, Michigan. 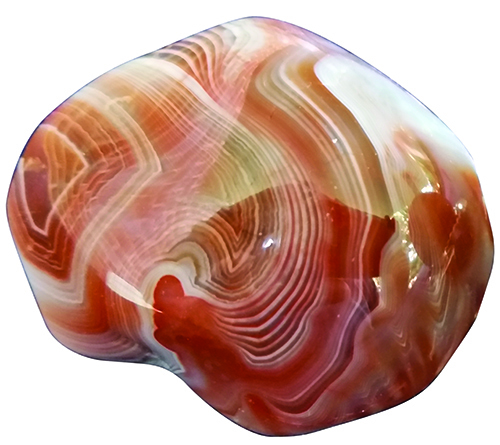 Upon arriving, the park ranger let us know that the annual Rock On with Lake Superior Agates rock show had just started. What a great surprise! We did not waste any time. We set up our campsite and went to the show. 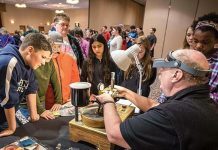 The two-day event was packed with educational demonstrations, rock and mineral presentations, and of course tables of Lake Superior agates and other local mineral specimens. There was something for all ages. One of the presentations that especially caught my attention was Erik’s Yooperlite display. During our time at the show, Erik began sharing the story of the discovery made on the shores of Lake Superior. We listened intently and examined the amazing fluorescing display. We were so intrigued with the display that, as the show was closing for the first day, we decided then and there to change our travel plans and stay on for a few more days. The next morning, I headed directly to the area where Erik was presenting. We talked for a few hours, and he explained more about his discovery. He has been a rock collecting enthusiast since childhood. It began with his dad taking him rock collecting when he was very young. Needless to say, he never lost the passion for collecting or his curiosity about minerals. As we all know, necessity has been called the mother of innovation, and in Erik’s case it may be the mother of discovery, too. In addition to being a collector and dealer of Lake Superior agates for years, he also teaches others how to find the elusive U.P. treasures. In his quest to become more successful with his knowledge of agates, his curiosity caused him to see if agates would fluoresce. 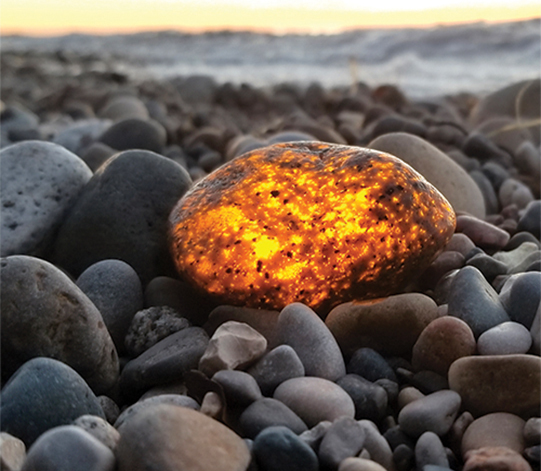 One such night in June of 2017, with an inexpensive 3 LED UV long wave flashlight, he went rock hunting around 4 a.m. and discovered a rock that looked like a hot lava ball. He was “excited beyond containment and wondered what it was,” Erik explained. 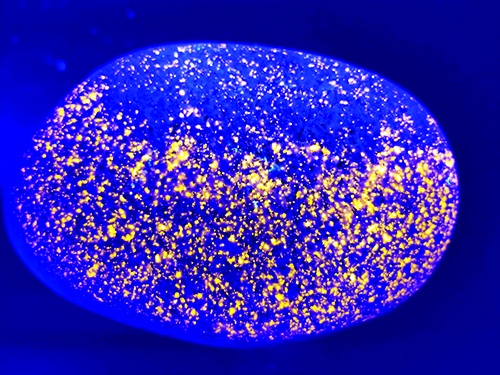 upgraded his equipment to include a 100 LED UV flashlight, which significantly increased his discoveries. This led him to begin working with a manufacturing company to produce a cost-efficient UV flashlight to help people locate Yooperlites. As Erik would learn, his discovery of fluorescent sodalite would bring forth great interest from a variety of people. 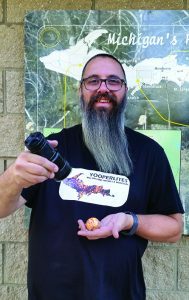 One example of this came about in January of 2018, when the online sale of some of Erik’s Yooperlites attracted the attention of geologist Raymond Laughlin and Shawn M. Carlson, a geologist and mineralogist, respectively, both from Michigan. They purchased some of Erik’s rocks and began to technically analyze the specimens. With access to the geological laboratory at the Michigan Technological University (MTU) in Houghton, Michigan, the technical assessment of the Yooperlite mineral was under way. I was intrigued to learn of the connection to MTU, because during our first trip to the Upper Peninsula, we stopped at the A. E. Seaman Mineral Museum, which is located on the campus grounds at MTU. It is one of the premier collegiate mineral museums in the United States and very much worth visiting. The following is an excerpt of the Yooperlite mineral analysis from MTU, (used with permission from Tony Nikischer, publisher of Mineral News, info@excaliburmineral.com). Preliminary SEM/EDS analyses conducted at Michigan Technological University showed only Na, Al, Si, Cl, and O in the mineral’s spectrum. Sulfur was sought but not noted with EDS (below detection limits) but was detected by follow-up EMP/WDS, which yielded a composition of: 36.47 wt.% SiO2, 30.84 wt.% Al2O3, 25.39 wt.% Na2O, 0.31 wt.% FeO, 0.05 wt.% K2O, 7.02 wt.% Cl, and 0.11 wt.% SO3 (average of three very similar analyses). Microscopic studies were conducted using Kyowa SDZ-P binocular stereozoom microscope and a Kyowa ME-POL2 petrographic and ore microscope equipped with a Supper spindle stage. EDS spectra were obtained at Michigan Techno-logical University on a JEOL 6400 tungsten-source SEM equipped with a 4pi Analysis (Inc.) ultrathin window EDS detector and operated at 20 kV, using standards from Astimex Standards (Ltd). 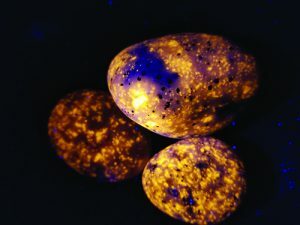 Yooperlite, which this analysis has shown, is a syenite clast containing fluorescent sodalite, at this point is reportedly specific to the shores of Lake Superior in Chippewa and Luce Counties and in the Keweenaw Peninsula. It is the first verified and documented sodalite from the state of Michigan. Geologically, it is thought to have formed in Canada before being carried by glacier from the Canadian Shield (Laurentian Plateau) to Michigan, according to the report. 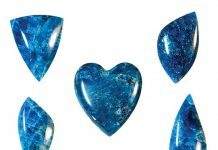 After reading the technical analysis, it may seem like nothing was new in the mineralogical world since sodalite is a fairly common mineral found in several places around the world. What makes this unique is that it is the first time sodalite was discovered in Michigan. 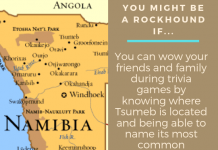 From an earth science and rock collecting perspective, it is a great discovery. It is the type of discovery that creates a rudimentary basis for sparking interest in earth sciences for young and old alike. One never truly knows the influence an interest in earth science may have. 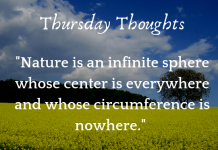 Case in point: It’s been said that a 5-year-old Albert Einstein was given a compass by his father, which sparked in Einstein a lifelong interest in the nature of the magnetic field. Erik Rintamaki’s Yooperlite Night Picking Tours is available for bookings. 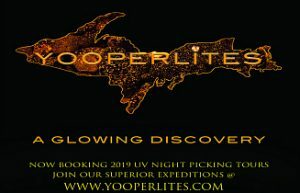 Visit Yooperlites.com to learn more and book your Upper Peninsula Yooperlite Hunting excursion.